Here she is folks, the new boat. Luckily I managed to blag my Mum's car to get myself down to the beach for a paddle. I headed to the Causeway at Sully Island to launch. I decided to paddle out to Flat Holm Island some 4½ miles offshore & to the left of this image, not Steep Holm that is on the right. Loving the lines of my new boat. I get on the water & immediately stick her right on edge, hip in the water with no probs. Whenever I try a new boat I always do this first. 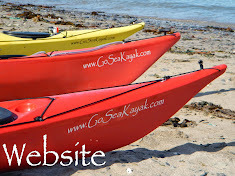 Edging is so fundamental to sea kayaking that a boat thats hard to edge is a pig. The Etain however edges like a dream. Next i tried an inside turn & she quite surprised me how quickly she turned. Not sure if I was imagining it but it felt like she spun on her widest point slightly to the rear in the Swedish form design? Imagined or not she likes inside turns. Heading out I spot some tasty waves in the tidal confusion that regularly churns up on the West side of Sully Island. I have a laugh as the bow rises & falls on the waves giving me a refreshing face wash. I turn back in to surf a few waves before continuing on to Flat Holm. Back underway & the sea is a little choppy in the fresh breeze, its only sea state 3 (slight) but its bouncy enough. its fair to say it could get lively today as the tide turns into the wind so I decide not to linger on Flat Holm & leave early for Lavernock. Arriving at Flat Holm there was a little tidal action in the race facing West, I decide to head South & lap the Island. I have to push a bit into the tide as I find it starts to flow more North Easterly approaching the Island. Perfect spot for a break. I left half an hour before the tide turned to give me a chance of reaching Lavernock. In fact I was hoping to get to the rannys tide race just as it started to pick up, with the wind in the South West it was likely to be fun. Holding a good course as I pass Ranny Buoy. Here comes the fun bit. With waves breaking from my left evan though I'm still a long way from shore. I turned side on just to take pictures, when the camera was away I was having a hoot surfing in the Etain. Nice swells to hook into. Further inshore & out of the tide it all went quiet again. I practice a bit more edging, inside turns & some cross bow rudders. I evan threw in a roll for good measure. Congratulations!!! Beatiful kayak!!! Carpe Diem!! !